Magnetic resonance imaging (MRI) is the most effective diagnostic technique in medicine that allows to identify the pathology and its degree of development in the human body. In the appointment your doctor for MRI, the patient must pay attention to the types of scanners, the cost of the procedure, characteristics, etc. Need to be some limitations set for the completion of this procedure. Here we should talk about typical factors, the presence of which the MRI is conducted with the fulfillment of additional conditions (obesity, pregnancy etc.) or not possible in principle (the presence of a built-in pacemaker). The right choice of the imager will provide patient the quality and effectiveness of the obtained results and, consequently, the safety of his health. The tension of magnetic field is measured in units of Tesla. The power of tomography is a major feature of the work. With strong capacity (up to 1.5 Tesla), the device is able to identify pathology in the body at an early stage of development. Such devices are called high field. You must also remember the high field MRI scanners (three Tesla), which is particularly important in the diagnosis of the brain, where low (approximately 0.5 Tesla) and sredneimportnye (0,5 Tesla) MRI scanners are unlikely to have the ability to detect pathology. In addition, the capacity affects the speed and efficiency of the procedure. In addition to diagnosing the internal structure of the human organs, imaging can determine the order in which they are functioning. The detection of vascular disease, there is no need for contrast agent. Today, there are two main types of scanners: open and closed. During the procedure, the apparatus is of the closed type, the patient is placed on a special table, and then automatically moves inside the imager, which is in the form of a wide elongated cylinder. This can cause some problems for people with claustrophobia. Before examination, the patient is offered written answers to a little survey in which one of the issues is the presence of this phobia. Usually, the doctor conducting the study helps to reduce discomfort during imaging of such patients. In addition, the reason for the refusal of admission of a patient to a closed unit, may be the inconsistency of its weight class (typically, the maximum weight is 150 kg). Scanners open type not preclude undergoing an MRI for individuals who have problems with obesity and claustrophobia. 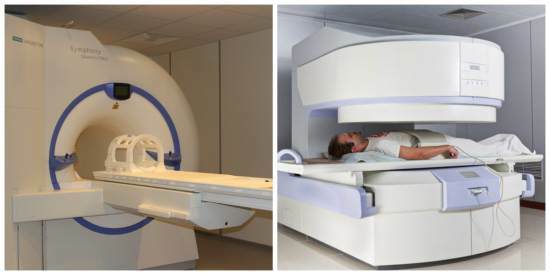 As a rule, the scanning magnets are positioned at the top and bottom of the unit, and the space of the patient remains open. However, experts advise to prefer still closed scanners than open. This is due, firstly, the power level of the apparatus. At the closed scanners it reaches 1.5 Tesla, open only 0.5. Open devices because a 0.5 Tesla (which in itself is a pretty low number), to produce the scan much slower. Secondly, the advantage of a closed high field MRI over open type is to minimize discomfort during the procedure and resistance to unexpected movements of the patient. According to professional doctors, the market of consumers, the favorite equipment looks foreign companies «Siemens» and «Philips». 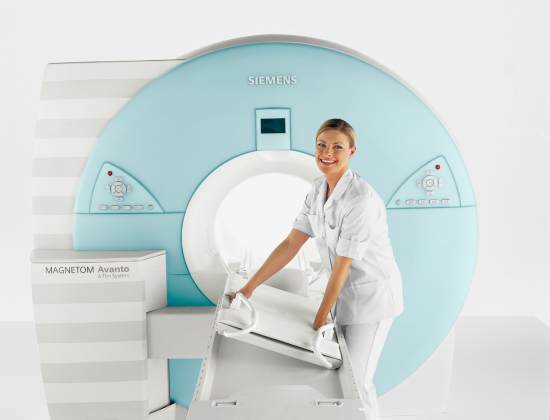 The German company «Siemens» offers the buyer about ten types of scanners. The average price range varies from 15 000 000 up to 45 000 000. Popular devices of the company are: Trio 3T, 1.5 T Symphony c Tim. The products feature modern technologies, allowing to carry out surveys with the highest precision and safety. Each model is economical, versatile, simple to operate, which makes the products more presentable. The technique works silently and without any technical interruptions. He will remain faithful and reliable assistant, no matter how much he works. Manufacturing company «Philips» is no less popular among buyers. Among the best-selling products, it should be noted the Diamond Select Achieva 30T, Green Line is 1.5 T. the Main advantages are: the equipment of gradiente characteristics, technologies Sence. The technology used in the production of this technology make it a welcome guest in many clinics around the world.